Comics are currently receiving a great deal of positive feedback in the arts pages and are considered one of the few growing segments in the book trade. For those who write and draw comics, however, it is seldom a worthwhile business from an economic viewpoint. The work itself is complex and time-consuming, and considering sales figures are often only in the three- or four-digit range, especially when it comes to more sophisticated, longer auteur comics, the profit margin that remains for authors and artists is minimal. Comic artist Michael Cho | © Lars von Törne Michael Cho estimates that roughly 50 percent of his work is directly related to comics. 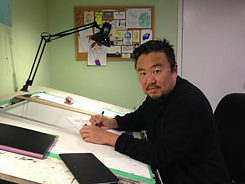 Other cartoonists he knows work as art teachers at schools, are involved in the production of animated films, do illustrating work for newspapers or earn their money as visual recorders for corporations, making sketched notes of company events. Joe Ollmann, whose graphic novel The Abominable Mr. Seabrock was recently published by renowned publishers Drawn & Quarterly, agrees. “Almost everyone making comics in Canada has some kind of part time employment or freelance work,” says the author and illustrator from Hamilton, Ontario. For example, many artists he knows draw storyboards for movie companies. “I suspect that maybe 15 percent of Canadian cartoonists make a living strictly from making comics,” says Ollmann. 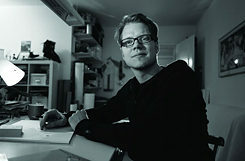 The reason Joe Ollmann has been able to focus mainly on his graphic novel for the past five years without having to rely on a permanent income from a full-time job is indirectly linked to his comics: selling film rights from one of his earlier works earned him enough money to make a living for a couple of years. Comic artist Joe Ollmann | © Joe Ollmann In Germany, the number of comic artists who can live completely off their income from pictorial narratives is likely to be even lower. In Canada, iconic stars like Jeff Lemire or Fiona Staples are financially well-off because they work for the profitable US comics market. There are hardly any comparable foreign business opportunities for German cartoonists. This is why, there are only a few artists – aside from internationally renowned best-selling authors such as Ralf König – who get along without other sources of income on top of writing and drawing comics. As a result, crowdfunding platforms such as Patreon have been becoming a major additional source of income for comic artists. 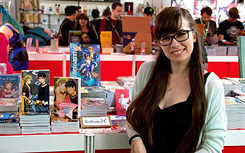 One example is the German-Japanese artist Mikiko Ponczeck, who won a Max-and-Moritz Prize, which is the most prestigious German comic award, for her Crash’n’Burn manga at the 2016 International Comic Salon in Erlangen. She currently has almost 150 supporters who pay her small monthly sums via Patreon, totalling 740 dollars per month. In return, supporters receive access to exclusive comic strips and tutorials with major contributors being rewarded with original drawings. Comic artist Flix | © Hans-Jürgen Büsch The fact that Flix can nevertheless support his family by writing and drawing comics is probably owing to the fact that he diversified his business in terms of publishing forms from the start. Many of his long comic narratives and series appeared as newspaper comics in FAZ and Tagesspiegel, and in the children's magazine Dein Spiegel (associated with the news magazine Der Spiegel) before they were published in books. He also draws funny cartoons, sometimes illustrates books and occasionally produces commercial illustrations but only if he can follow his personal style, he emphasizes. “My grandfather was a small farmer who planted many different varieties at the same time, without knowing which of them would bear fruit,” says Flix. “That’s basically the way I do it, too.” Despite his popularity among readers, his commercial success is difficult to plan: some of his books, such as the collected Heldentage strips, which first appeared on his website, sold only a few hundred copies. Other books, such as his adaptation of Don Quixote have sold more than 40,000 copies – a considerable figure for auteur comics in Germany.